Architect and artist Nada Shuaib launched her solo exhibition Inhale…Now Exhale at Spaceus on Saturday, March 16th. Her Third Culture Kid identity- bridging Sudan, Saudia Arabia, and the United States- is the base out of which her artwork grows. The exhibition includes one sculpture and five paintings that are Shuaib’s expression and exploration of the self. 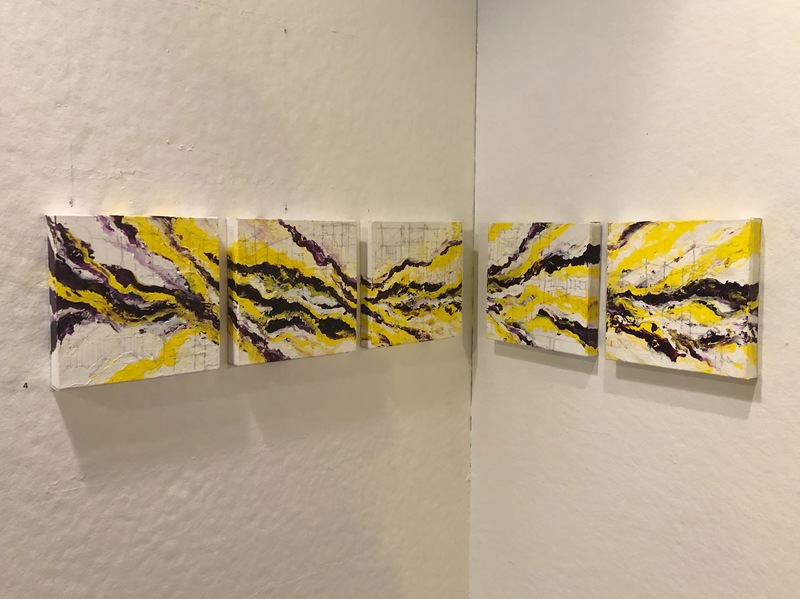 Her works are harmonious in their colors, mostly linked by purple and yellow. 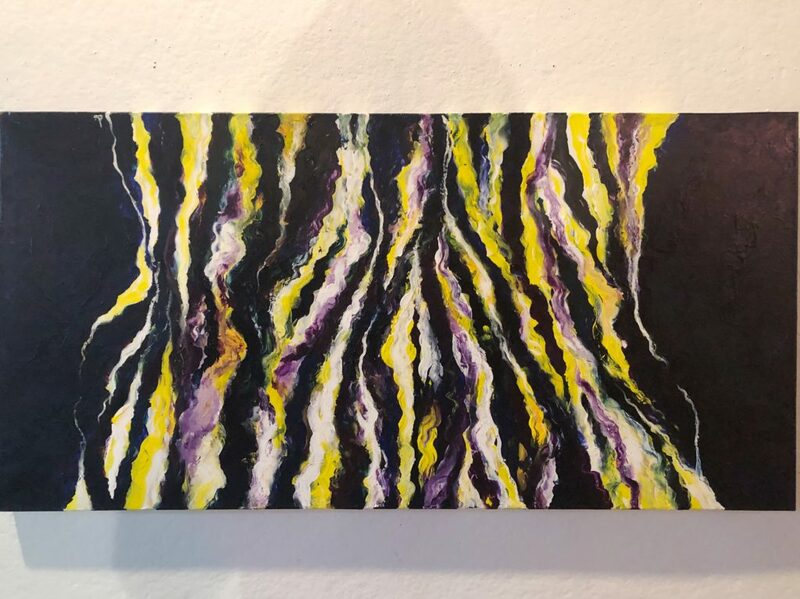 In her personal statement, Shuaib writes that these colors, “represent inhale vs. exhale, shadow vs. light, beginnings and endings”, dichotomies that encompass her life experiences. 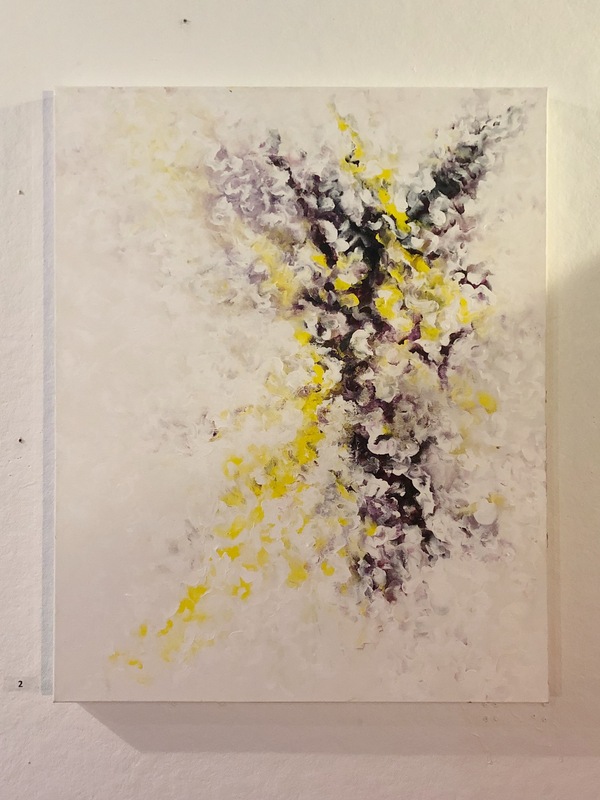 Additionally, these pieces are unified by a sense of rhythmic movement, a musicality that is also apparent in Shuaib’s decision to name them after songs that are personal to her. Shuaib writes about wanting to create an “infinite spiritual sensory experience” in Surfin’- Kid Cudi. 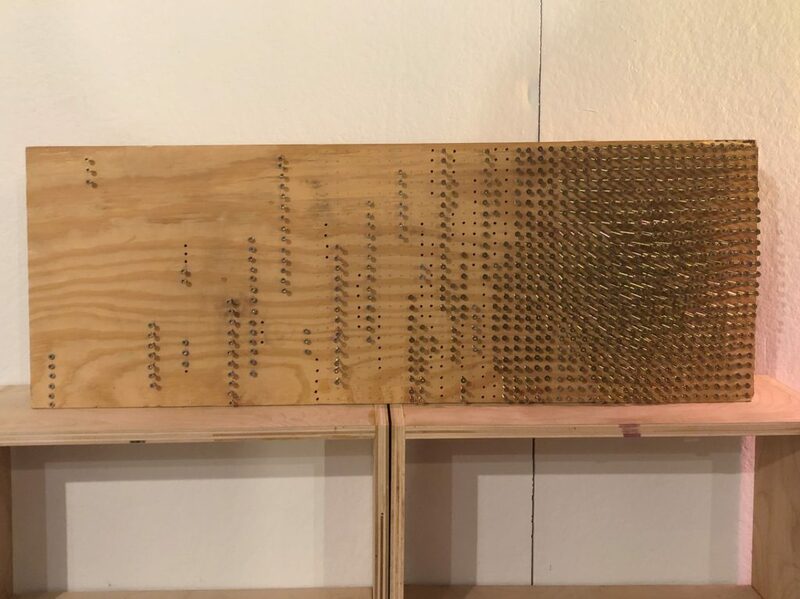 In her experience with the piece, she is guided by a voice in her head that tells her to use wood and screws. The sculpture really is infinite, as if it has captured the moment that a water droplet meets with water. Or perhaps it represents an immortalized beat within music, which Shuaib is inspired by. Just like the eponymous song, this piece is “Making [its] own waves”. I Gotta Find Peace of Mind- Lauryn Hill is an intense painting. It explodes like a supernova, yet it also has a quality of softness. This effect may be due to Shuaib’s process, as she takes, “a rapid heartbeat” and paints what she “learned with tender love.” Her light, blended strokes elicit peace, but this serenity is a result of the buildup of anxiety and agitation. 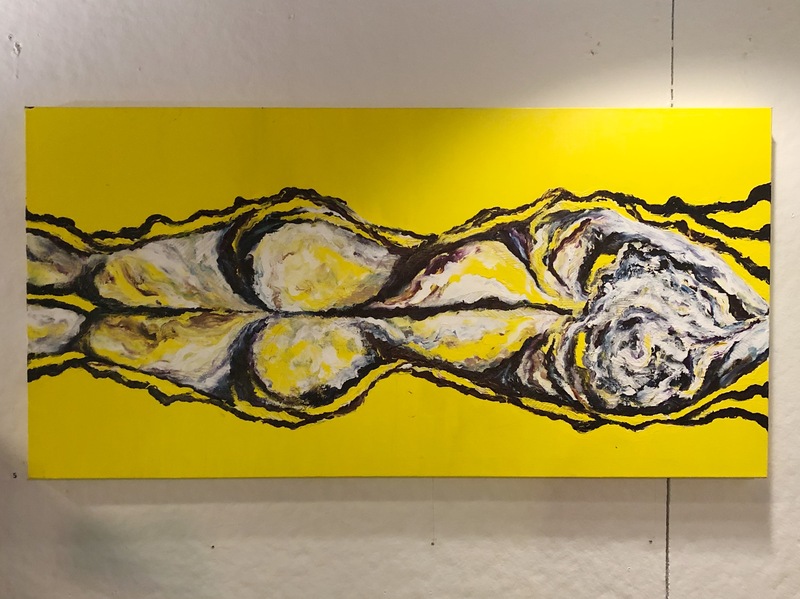 Shuaib’s talent with dichotomies creates tension in her works that express vulnerability. Similarly, Dream of a Lifetime- Marvin Gaye has a seemingly infinite outward motion. This painting is arguably the soul of the exhibition. 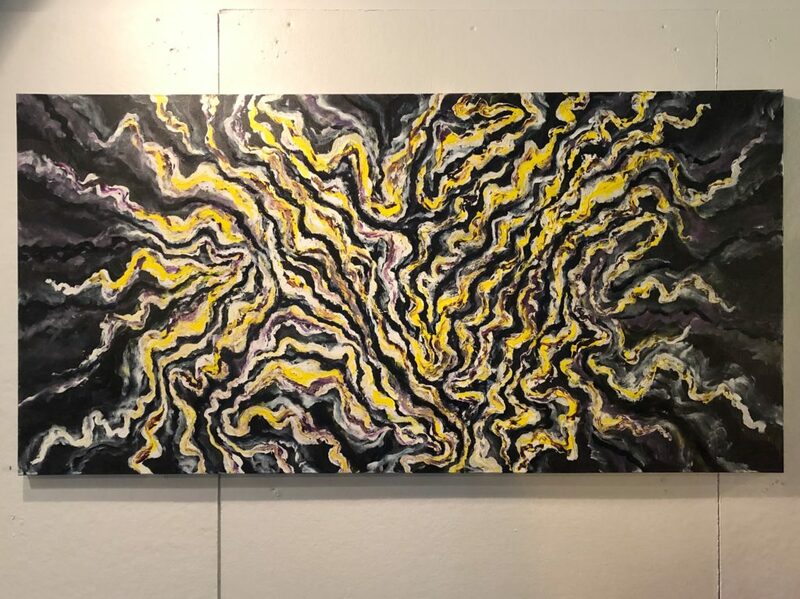 It is the artist’s connection to the Phoenix Star constellation and its emotional weight. In her theme of self-exploration and tense dichotomies, this piece is climactic. It shows the self as a fluid entity that is capable of catharsis and change. All of the Light (Interlude)- Kanye West is taking a leap into the world. Shuaib writes that she is trying to understand the world, “by diving into the light.” Understanding the self isn’t a remote process disparate from the world. Rather it is the contexts we are in that ask us to question ourselves that Shuaib is guiding our attention toward. Additionally, the lines of movement moving out of the sensual figure seem to represent impact. Through identifying and exploring ourselves, we are also affecting the world. Shuaib’s final piece symbolizes the discovered self. There’s no implication that this is the ‘final’ self, but there’s an understanding of fluidity and multidimensionality. She writes about meeting a cactus and observing, “its delicate details, fortitude, curves, and spiky edges”. These qualities are an inspiration to Shuaib, possibly because of the juxtaposition of roughness and softness. In a cactus, as in a human being, duality is not a source of separation. It is a sign of being whole. Inhale…Now Exhale was hosted at Spaceus from Saturday, March 16th to Wednesday, March 20th.